In August 2016, after a long and tiring number of years renting apartments and houses, my husband and I were finally able to purchase our very own home. With previous house cleansing rituals, I've invited friends and family outside of my circle to participate. However, now that we've added a full moon ritual component to our schedule this year, I decided to make one of our full moon rituals a house cleansing! This is the first time it's been solely my circle cleansing our house and it couldn't have been more perfect. 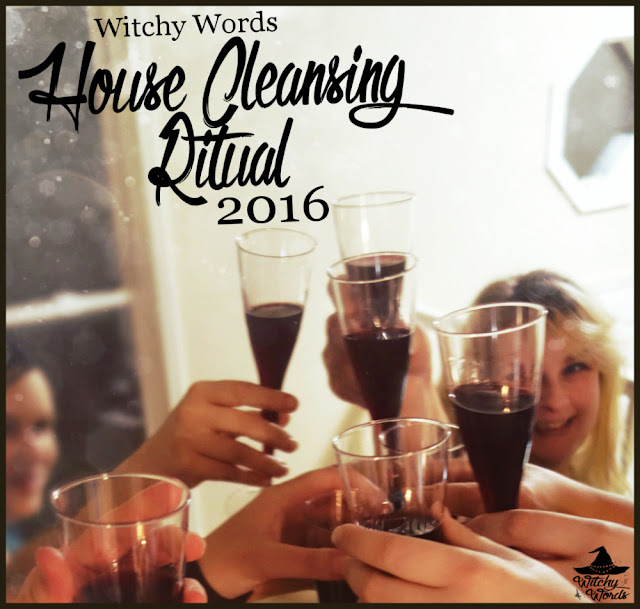 WHAT IS A HOUSE CLEANSING RITUAL? Most living spaces have been lived in prior to your purchase or lease. Even if it hasn't been lived in, it's been worked on by a variety of people. The land has likely been tracked on by living creatures of some sort. All of these people, animals and activities leave a sort of spiritual mark on a place in the form of energy. Energy's kind of a vague word, so let's define it a little further: It's a vibrational quality deep within the atoms of every cell in everything. While that energy may be positive or negative, it's much better to avoid chancing it by removing it from the space to create a clean slate for you and your life. By performing a house cleansing ritual, you set your space up for success by removing previous energy signatures and imbuing it with your own. A cleansing ritual could be as simple as burning cleansing herbs throughout the area or as intricate as the ritual I'm about to describe to you. There is no right or wrong way to do it; what matters most is that it is personalized and feels right for you. You will want to perform a house cleansing ritual before any actual living activities take place in the new home. This includes moving any furniture into the new place. For example, my husband and I received the keys to our new home on August 1st but didn't plan on moving until late in August. It gave us plenty of time to set up a ritual in between. It makes the most sense that you would cleanse your house of its previous life before its new life, and yours, begins. That being said, if you've already moved furniture into your home or you've already lived there for many years, don't be alarmed. Occasionally re-cleansing your house from time to time is not only appropriate but necessary. This ritual would work for that purpose as well. Rent from a reputable property management company. Do your research. Alternatively, if you're buying, get a good real estate agent. They can help you make the right decisions. Search for available homes in areas that are both affordable and safe. Visit the house twice - once for initial impressions and once to scour the house top and bottom - before touching the next step of the process. Talk to the neighbors on all sides to discover more about the area and the history of the home. Request police reports from the area to ensure safety. Call utility companies to see previous bills on the property for an estimate of living costs. Carefully read the lease or mortgage and any other contracts involved, highlighting concerns or changes I required along the way so I could discuss them with the property management company. If you're buying, do the inspection. Don't skip it. It might be a large expense but it's so essential to know what you're walking into before you agree to purchase the house. If you're renting, schedule maintenance to come out to inspect the property and fix anything necessary seven days after moving in. Unfortunately, even if you meet every physical and spiritual world needs, things do happen. It's hard to guess every situation you might end up in. If you find yourself in a bad situation, don't over-rely on witchcraft to see you through it. Make sure you continue to follow through with physical world needs. For example, when my husband and I had our last bought of bad property managers, we hired a contract attorney. I didn't do anything witchcraft related until I had lawyered up, doing what was necessary to legally protect ourselves and move forward. Out of everything I did, hiring a contract attorney was one of the best things we did and it helped resolve our issues with our property company faster than if we had not. The following ritual is heavily influenced by my beliefs as a nontheistic witch and is my personal take on a house cleansing ritual. Do what feels best for you in the end. Personalize it. Make it yours. Enjoy it! As I have mentioned before, there are many ways to cleanse a house. However, I believe that there are three essential steps to make a house cleansing ritual successful: Cleansing, protection and raising power. You must first cleanse the space. Perhaps this is a literal cleansing, where you mop the floors and steam clean the carpets. Perhaps this is a figurative cleansing with herbs and purified water. Maybe it's both! Whatever it is, use it to remove the physical and/or spiritual dirt from your living area's previous life. Before ritual, I scrubbed my place from top to bottom, using both conventional and homemade witchcraft cleaners. The house was immaculate when we purchased it but I wanted to make absolutely sure there wasn't a speck of dust or a cobweb anywhere. You then need to protect that space. This may involve anything from iron to quartz crystal to a protective charm. Whatever feels appropriate. By protecting it, you are preventing all of the energy you just removed from returning to the home. Before ritual, a protective rune chain was strung between the sitting room and kitchen. Quartz was placed in all the windows, doors and other entrances to the home and a penny was placed at each exterior corner for a total of four pennies. I encircled the outside of the house with salt, leaving the front door unprotected so the negative energy had a place to go during ritual. Once it is protected, your last step is to raise power. Maybe you'd like to cast a circle, sing a song, perform a spell or dance like no one's watching. Whatever you decide, this should be incredibly personal. It should have your soul written all over it. The reason you should so deeply customize this part of the ritual is because you are leaving your own personal energy mark on your new space. I also believe repetition is key. I believe there is no overkill. I believe in going all-out. If your style is more laid back, use it! Keep it simple. However, in the ritual I'm about to describe to you, you'll find personal spells, crafts and activities that repeat those same three concepts of cleansing, protecting and raising power over and over again. There is no doubt in my mind that the house I now live in was properly cleansed by our house cleansing ritual. My wonderful circle, Circle of Fountains, has been a huge part of my life and has had a large influence on my craft. I couldn't think of a better way to do this ritual than to dedicate it to my circle and use their help in cleansing our space. Because of this, everyone had a hand in creating the individual components of this ritual. Our house cleansing ritual began by smoke cleansing everyone with burning herbs. We felt it was essential to give everyone time to clear their heads and cleanse their energy before entering the space. Fortunately, I had plenty of time to set up for the ritual, so my tools were pre-cleansed prior to ritual time. I was first to be cleansed, followed by Andrea and Phaedra. The order was important because Andrea was tasked with putting four pennies at each quarter of the house. Coins attract wealth and prosperity and the copper in pennies has protective properties. Placing four at the corners of your property is a fairly common protective practice. In addition, Phaedra had a special protective barrier she wanted to create at the perimeter of the property. The reason I needed to first is because I needed to create a special sigil in front of the door before anyone passed in. I don't plan on showing the finished sigil or describing the meaning. As much as I'd love to guide everyone on everything I've done to cleanse and ward my property, some things are best left secret just in case. Something to cleanse yourself and your participants with. I would suggest an herb bundle, incense or salt water. A sigil you have either created or researched online. A mat to place over your sigil so it doesn't get scratched as people walk over it. Once inside, Phaedra and I charged a rose quartz tower as the last step of her perimeter protection. I then had everyone join hands, focus on positive thoughts and pass those to their neighbors. As they did that, I used my athame to cut a circle of protection around us. And with that, the circle was open! This is a staple of my house cleansing rituals that I greatly prefer. 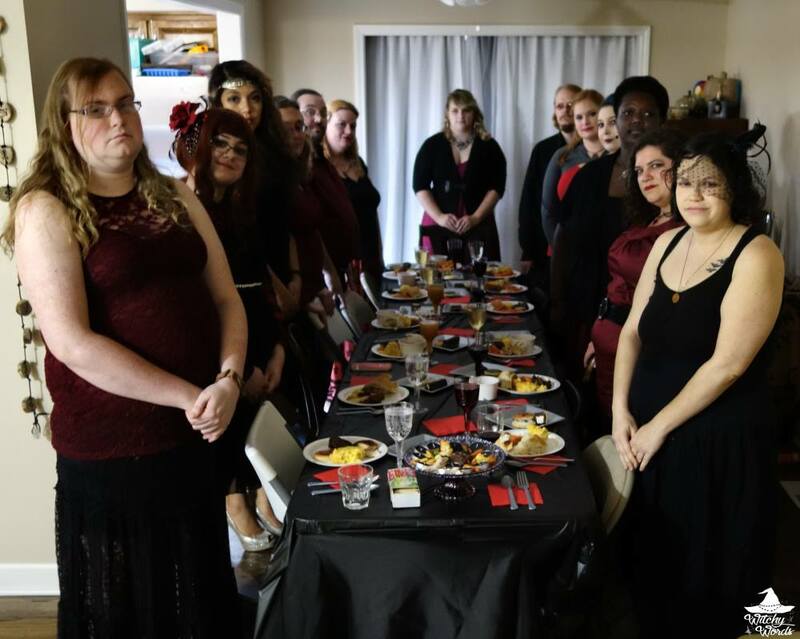 Because I had eight people attending ritual, I requested that everyone wear the color of their preferred element and call those elements in pairs. Before beginning, I lit a black candle on the main altar to represent banishing and cleansing. We started with Andrea and Amy on air. Amy used a bundle of herbs to smoke cleanse the house as a form of air elemental cleansing. We walked the perimeter of the house in a clockwise motion to the south-most corner where Olivia, our Novice, and Kira called upon fire. Kira then used a lantern with a black tea light candle inside to cleanse the house as a form of fire elemental cleansing. We then moved on to west, with Kolika and Abby calling water and Kolika using purified water to cleanse the house. And finally, Phaedra and I called north, with Phaedra using salt to cleanse the house with the element of earth. Of course, this meant we all had to circle around the entirety of the house, including the basement and garage. This kind of elemental call and cleansing does take some time, particularly if you have a larger house, with it is entirely worth it. A candle for each quarter. A candle holder for each candle. A stable surface for that candle to rest on (let's not burn down your house before you live in it!). A bowl to catch embers and for the herb bundle to rest in after you're done. At this point, I lit a black candle on the center most altar to represent banishing as each of the following wards essentially "banished" a certain aspect of that element from the home. For this portion of the ritual, I requested some of my circlemates that have a particular affinity for a certain element create a warding of their choice - an item they could place somewhere in the house to protect against some kind of elemental calamity. Amy began with her air elemental warding. She said that this jar was meant to attract bad weather, like super cells and tornadoes, and trap it while allowing good weather, such as gentle rains, to still occur. Next up with Kira with fire. Kira's a heathen, so she created a hammer with a bind rune to ward against house fires. Kolika brought jeweled corn from her garden which she charged with anti-flooding properties as a water ward. And I created a terrarium jar as an earth warding to protect against foundation issues, a common problem here in Missouri. Because I only created one of the four elemental wards, I don't have a specific supply list but I certainly hope this inspired you! Just remember to utilize a black candle on your altar for this portion. One of my favorite spells to perform is my Negativity Absorbing Spell. You can click here to read more about it. I love this spell and have utilized it many times with significant results. It utilizes a simple science experiment to create a visual affect that works well with its intended use: Essentially sucking the negativity out of a space and trapping it into water. Once completed, I used salt to cleanse the water of any negativity the spell trapped. I took this water back with me to my rental property and disposed of it. If you'd like to read exactly how this spell is done and what you would need for it, click here. In addition to this, I asked our Novice if she would do something for the ritual. I didn't give her any specifics, but she came up with this adorable negativity absorbing poppet made out of household cleansing items, like a wash cloth and a sponge. Because she was a little nervous about charging it properly, we all helped her do it. At this point, I lit the center candle - which was white, gray and black. Not only is gray a neutral color, the combination of white and black was perfect for marking our transition from removing from the space to adding to the space, a transition between cleansing and raising energy. Laura, who unfortunately couldn't join us that night as she had another engagement, created a protection sachet for the new house. You can read about my protection sachet here. Laura's sachet inevitably varied from mine but that made it no less potent. There are many ways to go about a sachet and this was exactly what we needed! One of my most popular protection articles is my rune chain. Just like last time, I worked with Kira, our resident heathen, to create a rune chain filled with bind runes specialized to our house. I designed the bind runes and Kira put the chain together. Our rune chain is now very different from the one on the article and I don't plan on elaborating on the individual symbols or their meanings for the sake of protecting my home. Finally, Abby created a witch bottle for our home. Abby is a hereditary witch and her family's patron deity/spirit is Baba Yaga. Together, we charged the witch bottle. The spell was potent enough that it knocked Abby right on her rear. All of us, including my familiar Artemis, lent her energy so she could get on her feet again. Once again, because I didn't have a hand in the majority of this portion, I don't have a supply list. Just grab a gray (or black and white) center candle for your main altar! While I was shopping for this ritual, I came up with a wonderful little idea for raising power: A Wish Jar. In this portion, I filled the bottom of a decorative glass jar with rocks that glow in the dark. I then had each of my circlemates write wishes they had for the house on slips of paper that they put into the jar. This didn't just have to be for me in the house. Because my house is generally the central location for rituals and the circle, we generally call it the "community house." This means that their wish could also be for themselves or the circle as well. Once everyone had completed this portion, I sealed the jar, never to be opened again. We then charged it together with positive energy. With that, the final candle on the altar was lit: The white candle. At this point, Amy handed everyone percussion instruments. Using a shared app, we started a heartbeat rhythm on our phones. Amy instructed us that we were going to raise energy by sharing our heart with the house - because home is where the heart is! And with that, we scattered into the house to make some noise! This included all parts of the house, even the basement and garage. After a sufficient amount of drumming, power was raised. Stones for the jar (optional). Percussion instruments - or really, anything that makes noise. And with that, our ritual was complete! 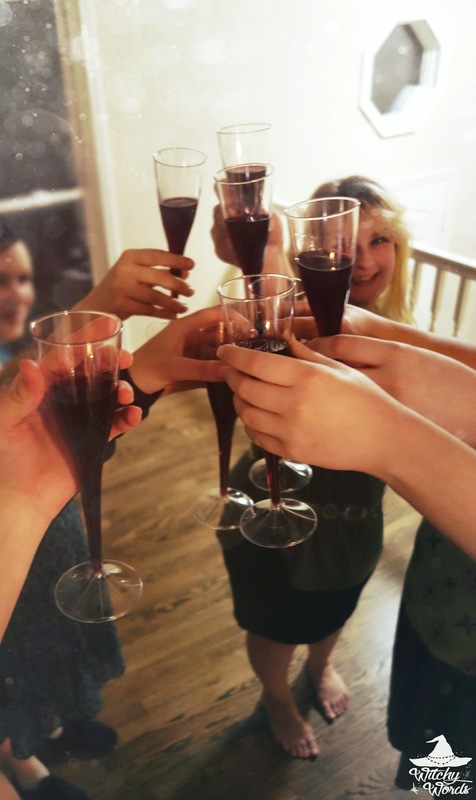 Instead of immediately closing down the circle, we continued to raise positive energy by drinking, socializing and being generally merry before calling the ritual over. Of course, once you're done, you'll want to release the quarters and close the circle. Always match spiritual/religious work with physical world efforts. Feel free to personalize everything. The more you the ritual is, the more effective it will be! Put a box together with all your essential tools. Make a check list to ensure to leave nothing behind. Be sure to purify everything before entering your new home, including yourself! Cleanse the space to remove previous energy signatures. Giving your home a thorough, practical cleaning. Sweeping your new space with a new besom. Smoke cleansing the area using an herb bundle. A black candle for illuminating every corner. Purified water sprinkled around the edges of every room. Salt scattered around the edges of every room. Protect the space from allowing that energy to return. Placing two pieces of quartz on either side of every window and door. Spreading protective ashes created from specific herbs and sigils written on paper and then burned. Placing one penny at each of the four corners outside of your house. Hanging an iron item near or above your door. A protective sachet filled with the appropriate herbs and crystals. A protective charm, such as a rune chain. Raise energy to put your spiritual mark on your space. Bless the house with what you look forward to while living there! Above all, be sure to have fun! While cleansing a house can be hard work, I never want to set the house with a cold, somber vibe. My house cleansing rituals tend to be loose and enjoyable for everyone. Cleansing is very important at the start of any year. It removes bad elements surrounding our homes and our family. Glad I was able to find the business web page of the things that were used on this cleansing.